In an effort to put more teeth into its so-called media “transparency” initiatives, the 4As today called on its members to put the association’s principles into practice, not just treat them as recommendations for best practices. In addition, the 4As unveiled plans to conduct a series of member meetings to discuss how to put the principles into practice. 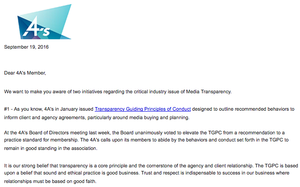 “It is our strong belief that transparency is a core principle and the cornerstone of the agency and client relationship,” 4As President Nancy Hill wrote in a letter sent to the association’s membership today, calling on them to adopt the 4As’ recently ratified “Transparency Guiding Principles of Conduct," and threatening “annulment of membership” for agencies that violate them. The 4As said it has scheduled nine meetings with members around the country beginning with last week’s Advertising Legal Affairs Committee meeting at the 4As headquarters in New York and running through its Western Region Finance Committee meeting Nov. 16 in Las Vegas. The stepped-up efforts come as some industry sources -- especially the Association of National Advertisers -- have been critical of the 4As' slow and tepid response to ANA-commissioned studies and aggressive recommendations to improve the transparency of media-buying principles, especially rebates and kickbacks from media suppliers paid to agencies. The ANA in August called on the 4As to clarify its position on media transparency and invited its board to meet with the ANA board to discuss it at its upcoming annual conference -- Masters of Marketing -- Oct. 19 in Orlando.